Azaleas are attractive and eye-catching shrubs used in landscapes, and are considered iconic. They would make a lovely option for your next landscaping project. Azaleas, with their beautiful blossoms, make a great addition to your garden area. This shrub has captivating flowers that vary in different colors such as red, pink, white, and purple. It offers early spring blossoms that stand out because of its bright colors. One of the best characteristics of azaleas is that they are not a hungry plant. Meaning, they do not require regular application of fertilizer unless necessary due to nutritional deficiency. 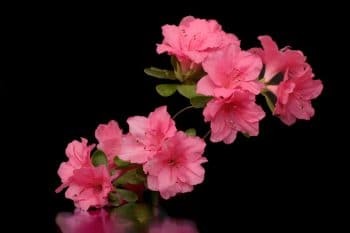 If you want to see the beautiful blooms of azaleas in your garden, be aware of the proper care as well as the appropriate fertilizing procedures. Although azaleas do not often require fertilizer compared to other blooming shrubs, the nutritional deficiency signs will tell you that its time for them to receive some nourishment. When it comes to when to fertilize azaleas, follow the appropriate schedule. In the case that your garden soil is applied with chopped leaves and other organic materials before planting the azalea, they will not require additional fertilizer because they already have the needed nutrients to grow. But, if the shrub is growing too slow, set up a fertilizing schedule. Furthermore, notice that azaleas need fertilizer when they produce smaller leaves than normal. Also, observe if the leaves turn yellow and then drop early. Other than the leaves, if the tips of the branch are dead, it means they are suffering from a phosphorus deficiency. So, if the symptoms of nutrient deficiency are very noticeable, a fertilizer is a great help! If you are not sure about the type of fertilizer that azaleas require, perform a soil test. If not, consider a balanced fertilizer including 15-15-15. These numbers refer to the nitrogen, potassium, and phosphorus proportionate amounts. Typically, nitrogen is what azaleas most likely need. This nutrient boosts the plant to grow faster. To help the shrubs absorb the fertilizer effectively, spread it all over the entire root area. To give you more valuable ideas on taking care of your azalea shrubs through fertilizing, consider the following tips. Do not fertilize during the drought or when azalea roots cannot access sufficient water. Fertilize only when azaleas show some signs of nutrient deficiency. When using fresh woodchips or sawdust, its necessary to fertilize your azaleas. Do not set a fertilizing schedule if azaleas do not require throughout the growing season. If you follow the above guidelines, you’ll never go wrong in growing your azalea shrubs. Sit back and enjoy its blossoms!